Vladimir Yevgraphovich Tatlin (Russian: Влади́мир Евгра́фович Та́тлин; December 28 [O.S. December 16] 1885 – May 31, 1953) was a Soviet painter and architect. With Kazimir Malevich he was one of the two most important figures in the Soviet avant-garde art movement of the 1920s, and he later became an important artist in the Constructivist movement. He is most famous for his design for The Monument to the Third International, more commonly known as Tatlin's Tower, which he began in 1919. 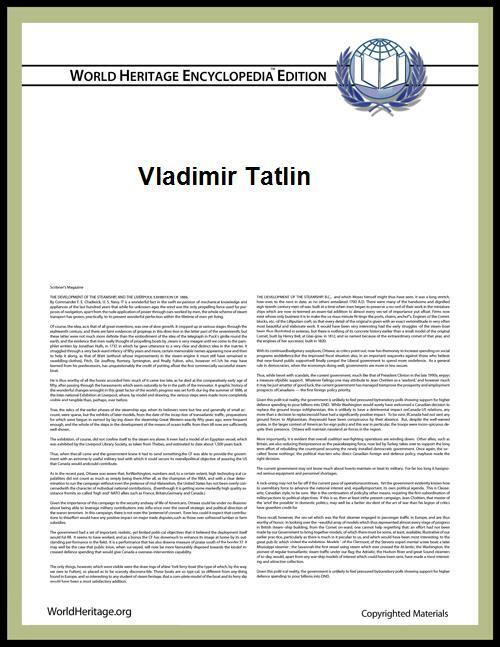 Tatlin was born in Kharkiv, the son of a railway engineer and a poet. He worked as a merchant sea cadet and spent some time abroad. He began his art career as an icon painter in Moscow, and attended the Moscow School of Painting, Sculpture and Architecture. He was also a professional musician Ukrainian-bandurist, and performed as such abroad. Tatlin achieved fame as the architect who designed the huge Monument to the Third International, also known as Tatlin's Tower. Planned from 1919, the monument was to be a tall tower in iron, glass and steel which would have dwarfed the Eiffel Tower in Paris (the Monument to the Third International was a third taller at 400 meters high). Inside the iron-and-steel structure of twin spirals, the design envisaged three building blocks, covered with glass windows, which would rotate at different speeds (the first one, a cube, once a year; the second one, a pyramid, once a month; the third one, a cylinder, once a day). For financial and practical reasons, however, the tower was never built. Tatlin was also regarded as a progenitor of Soviet post-Revolutionary Constructivist art with his pre-Revolutionary counter-reliefs, three-dimensional constructions made of wood and metal, some placed in corners (corner counter-reliefs) and others more conventionally. Tatlin conceived these sculptures in order to question the traditional ideas of art, though he did not regard himself as a Constructivist and objected to many of the movement's ideas. Later prominent constructivists included Varvara Stepanova, Alexander Rodchenko, Manuel Rendón Seminario, Joaquín Torres García, László Moholy-Nagy, Antoine Pevsner and Naum Gabo. Although colleagues at the beginning of their careers, Tatlin and Malevich quarrelled fiercely and publicly at the time of the 0.10 Exhibition in 1915 (long before the birth of Constructivism), also called "the last futurist exhibition", apparently over the 'suprematist' works Malevich exhibited there. This led Malevich to develop his ideas further in the city of Vitebsk, where he found a school called UNOVIS (Champions of the new art). Tatlin also dedicated himself to the study of clothes, objects and so on. At the end of his life he started to research bird flight, in order to pursue one of the great dreams of humanity: to fly. Tatlin was buried at the Novodevichy Cemetery in Moscow. ^ a b Lynton, Norbert (2009). Tatlin's Tower: Monument to Revolution. New Haven: Yale University Press. p. 1. ^ Tatlin, Vladimir Evgrafovich: Counter-relief (Material Assortment). The State Tretyakov Gallery, 2013. Retrieved 10 May 2013. Archived here.